It's a funny punch line, emphasizing the importance of flossing, but it's true. Flossing your teeth after meals (and twice daily) is just as important as brushing to keep your mouth clean, healthy and fresh. gum problem and bad breath (which require both brushing and flossing to prevent). If one fails to keep up their oral hygiene, tooth decay and gum disease (gingivitis and periodontitis, respectively) will affect your oral health. 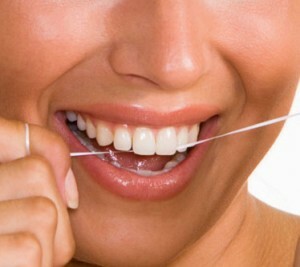 flossing lasts more than two weeks, get some help from your dental professional. There are several different types of floss (including waxed, unwaxed, and tape floss) – normally, easy gliding thin floss (like Glide) will be a good choice for average dental conditions. Gapped teeth or in areas under a dental bridge should require tape floss. Remember, you can get advice from your dental professional to find out which is the best choice for you. For people who have arthritis, advanced periodontal conditions or other issues of dexterity, additional dental cleaning home equipment will be very helpful. Electric tooth brushes (like Rotadent and Sonicare) and dental irrigators (like Hydrofloss and Waterpik) are very efficient tools to maintain proper oral hygiene. Remember to brush and floss twice daily (and after meals)! These important habits and routines will keep your teeth healthy, happy and looking fabulous!